My sun room and its many changes now has a refreshed look. I have shown you bits and pieces of this room for the last couple of months and now here is the whole room. I love color and loved this room in each form it has been through, but I just needed it fresher and lighter with a few pops of color in the accessories. I replaced the old wicker chair with this bench. So far this fern is doing quite well. 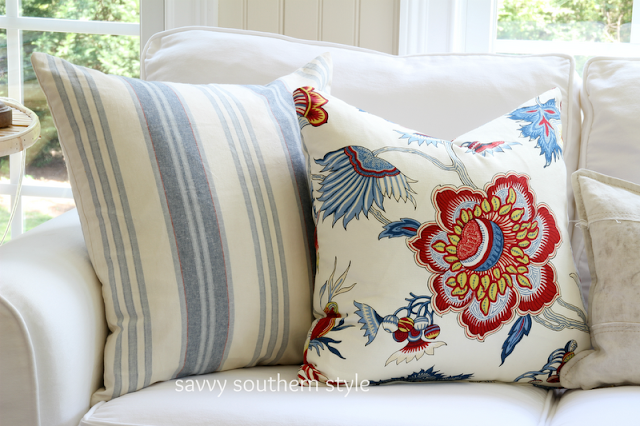 Striped pillows are from Pottery Barn outlet and the floral ones I purchased from Joss & Main with a credit. My view standing at the kitchen sink first thing in the morning filling the coffee pot with water. You can see the many before looks here. I am the first!!! What??? Kim it is simply a beautiful porch. I can tell you have put a lot of thought into this room and it really shows. So soft and fresh. Awesome job!!! I love it. I adore all the natural light, and those pillows are so pretty. Loving the pops of blue! 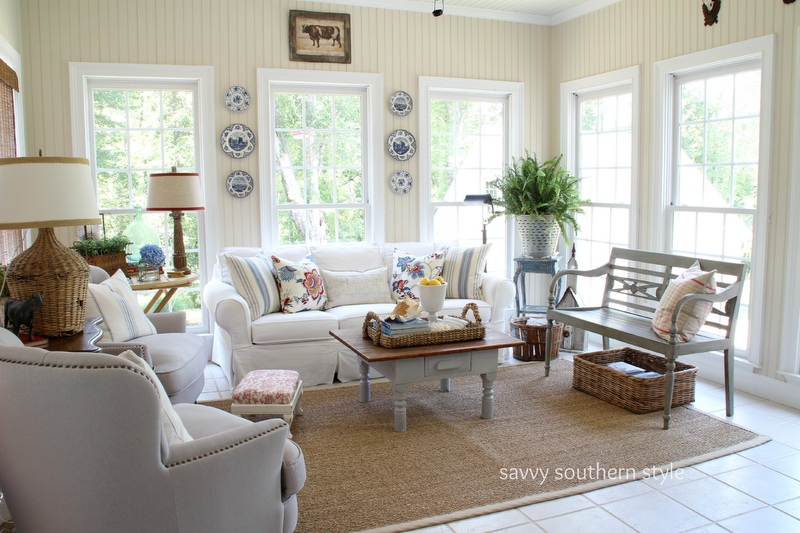 Love the sunroom. My favorite piece is the vintage demijohn lamp. I love it! Do you know there used to be a warehouse on Huff Road where I used to get all my demijohns.... Priced 18.00- $50.00(for the largest ones). It closed before I moved to NOLA in 2008. My only suggestion might be to add a floor lamp to the right side of the room near the bench to help balance the light in the room. Great room! I'd live in there. Best! I absolutely love all the elements of this room! I love the vignettes captured in the baskets and the bench is great! The pillows add so much with the pop of color. Enjoy! Oh my gosh. This is neutrals done perfectly. Adore the pops of color. The little sachets on your coffee table are very cute too. :o) Come visit me...I blogged about you today. What a lovely room and a great view. I liked this sunroom of yours each time I saw it, but this is my favourite version. I love the art pieces above the windows. Love the colours and the pillows look so comfy. I definitely need new pillows for our family room after seeing how cushy yours look. Oh, and a fern for some color and 'life' too. Thanks for continuing to inspire. 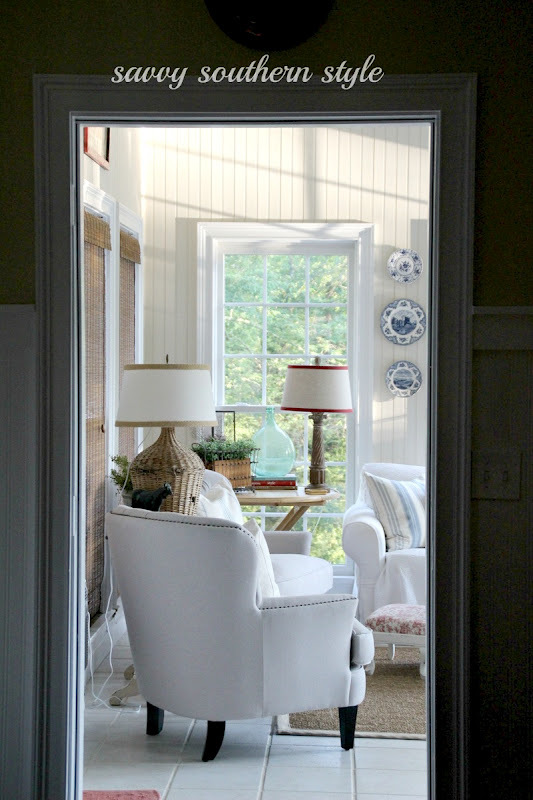 I like the beadboard and the lightness in the room. The blue accessories add just the special touch. Just spectacular! I love everything! What a beautiful room to wake up to and have a cup of coffee! Kim.....I really thought I would forever miss the green...but I don't. It's is lovely. Splendid Kim. The demijohn lamp is a vintage touch I adore. Hello again, Kim. Is it the lighting or did the TV cabinet get another painting? It looks lighter in the photo with the tray of demi johns. It looks wonderful and fresh Kim. Love this incarnation very much! Beautiful! Love the white and blue with the slightest touches of red and yellow! It's looking beautiful, Kim. You've definitely achieved that lighter look. Love the new bench. 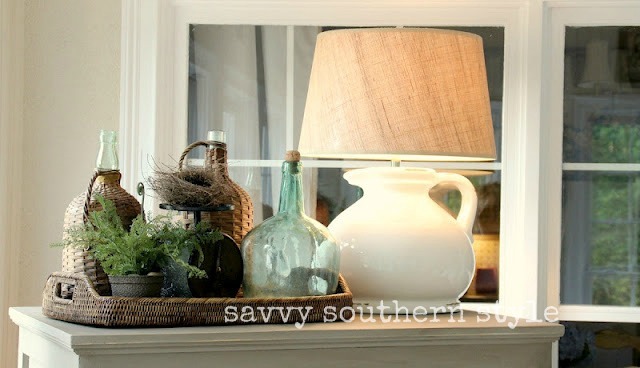 Great idea to make a demijohn into a lamp; it fits in so well with everything in the room, too. A very soothing look, love it! But I loved ALL the lives of this room. You ought write a book on this, Kim. 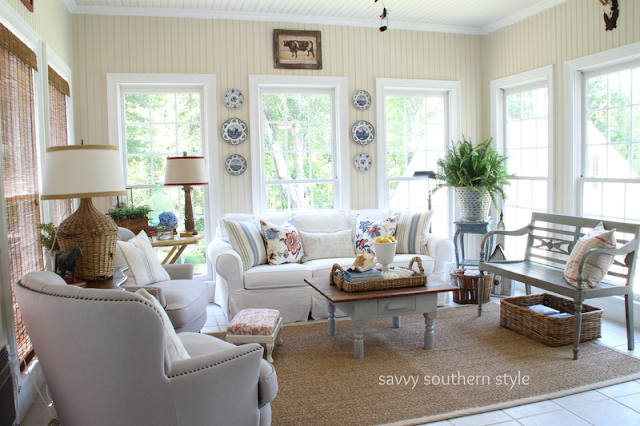 Your sunroom is gorgeous. I love how you have carefully selected all the furnishings and the accessories. Love the pillows and the bench. What a beautiful room. I tend to be such a color person, but your neutrals certainly give you lots of options and the ability to change it's mood very easily. Your sunroom is gorgeous! I could sit there for a very long time with my coffee! Perfection. Kim this room looks like a page from a PB magazine! Love all the changes! Lovely room, Kim. 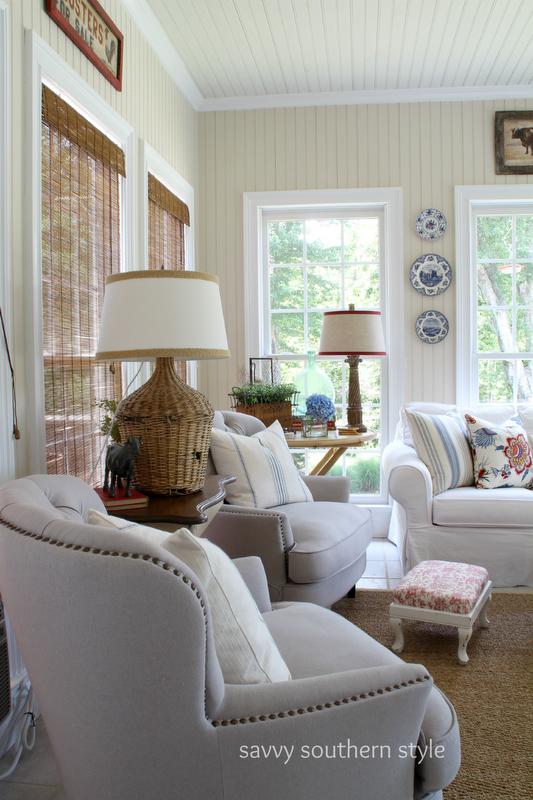 I really like the neutral pallet with pops of blue and your variety of textures, like the wicker demijohn lamp. It looks like a room you spend lots of time in. Beautiful, Kim! That room gives me inspiration for our living room which is full of windows like yours and also has shades like your room does. I love the light and airy feeling with mixes of stripes and florals. Elegant and comfy! I love the look, it's fresh, light and it has the totally awesome "Kim" look! Great job, again! Outstanding! What a beautiful room! It's just like looking through the pages of a magazine! I think it looks great every time you add a new touch or replace an item. I love to have coffee in my porch in the morning.. quiet, cool, just something makes the coffee taste better out there at that time of day. I love your sunroom and have enjoyed all of the changes that you've made to it. 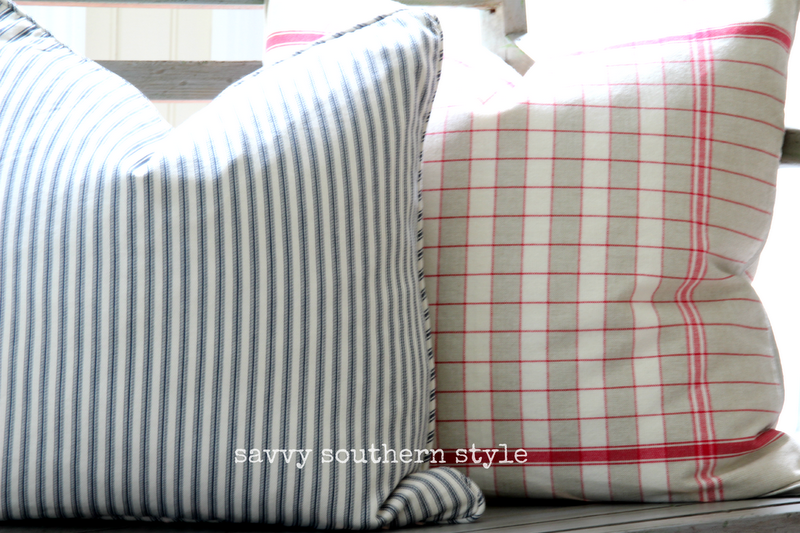 Right now I'm crushing on those pillows, all of them! Kim, its just beautiful. Simply beautiful. You definitely have the touch for putting rooms together that feel warm and welcoming. I love, love all of your vignettes too. You make it look so easy. I can't believe in a few short days we will be having dinner together. I am very excited to meet you. Just when I thought I couldn't love your sun room any more! Every corner and nook has a magical touch. Lovely through and through. Just wishing I had a sun room for you to come decorate! Love the freshness this room now has. Lots of fresh summer colors and lots of light. Just as a sunroom should be. Gorgeous! It looks so comforting and inviting-you've put it together so well! So very pretty, Kim. Love the fresh look! This is picture perfect! I love the demijohn lamp. Gorgeous! Kim it is stunning! absolutely beautiful. Love it all. 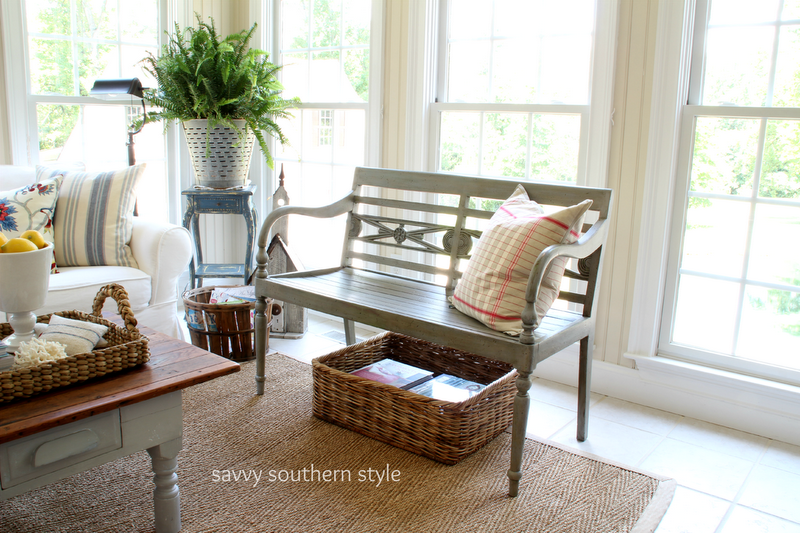 Thank you for your sweets comments on my blog…Your sunroom is beautiful! I looked back at the old stages and each one was lovely but I think I like this the best! I love your view in the morning as you are fixing your coffee! Those views are always my favorites because they are the real thing! Hope your week is going great! What a beautiful porch.How lucky for you.Love all the nice light.Your pillows are so pretty with the right pop of color. My favorite room in your house. Just so pretty and cozy feeling. I love how it all came together Kim. love. love. love this look, Kim. Especially in summertime! This is without a doubt, my very favorite rendition of this room. You've really outdone yourself. . . Beautifully done! Picture Perfect!!! I really like the lighter look. I also love the room when it is in reds and yellows. Great space, with so much light streaming in. Beautiful!! I love your sun room! The new pillows are gorgeous. Love your chairs and bench too. Beautiful job, Kim! That's just plain gorgeous. Wow. I love how fresh and airy it is. The thing about your transformations is I always like where you start almost as much as where you finish! Kim, this room is so bright and airy! Love the demijohn lamp! All of your accents are just wonderful! Such a lovely room. From the wall colour to the furnishings and all of the great accessories, it is beautifully put together. Your sunroom looks so light and bright. Love it. The bench looks so good in there. I adore the fresh clean look. Great room. Beautiful room, I love how bright it is. It is so serene and peaceful with the neutral palette. I love the simple pops of color. So pretty! I would love to have that view as I make my morning coffee! Looks perfect in every way! Kim, Great job on your sun porch. I loved all the color you had before but it looks so peaceful and calm now. What a lovely room....perfect for reading..entertaining or just enjoying a morning cup of coffee. Love all the accent painted pieces. You sure know how to put a room together! Kim, this is a beautiful room, I would love to sit there with a good book and a tall glass of ice tea. Hopping over from Anita's Cowgirl Up, I'm a happy follower of your sweet blog. I love every single thing about your room. Kim, it's just beautiful! I love how you have the small pops of red in the room. I love how this room has evolved....It is so fresh and beautiful....I could sit out there all day!...You have certainly done a magnificent job....I love EVERYTHING about it...A truly stunning room!! Your sunroom is gorgeous! I adore your demijohn turned into a lamp. It looks wonderful. We have a sunroom too, and I just love how it fills with light. You have my sun room...love it. So fresh and welcoming. I am a long time lover of light neutrals, and your pops of color add to the perfect look. What a wonderful change! The room is accessorized so well, but my fav is the demijohn lamp! 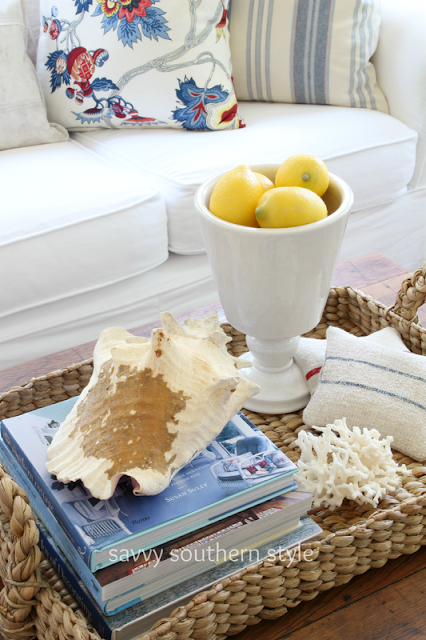 And then, you have those other ones in the wicker tray--love them all. So serene. I would like some icead tea and to just sit and relax out there. It is simply stunning I love this porch. I love color, too, but find myself lightening up all of my rooms and just adding pops of color, as well. You've captured it beautifully! Love all the changes! Your room went through a total transformation! Beautiful! I love the soft creamy colors and the warm welcoming feel! I love a lot of the before looks, but I do think this is my favorite! SO charming and summery.. Will you make it through the summer with this look? I'm sure Fall will bring us another surprise! Always love to see your changes.. you are the master for sure! You love Home Goods as much as I do. I love your use of baskets and the lamp is great...way to go Mr. Savvy! Kim, I just adore this room, and it is looking so beautiful! I too have loved it in each of it's 'outfits'. Not sure I could pick a favorite =) I just love your entire home....so beautiful! 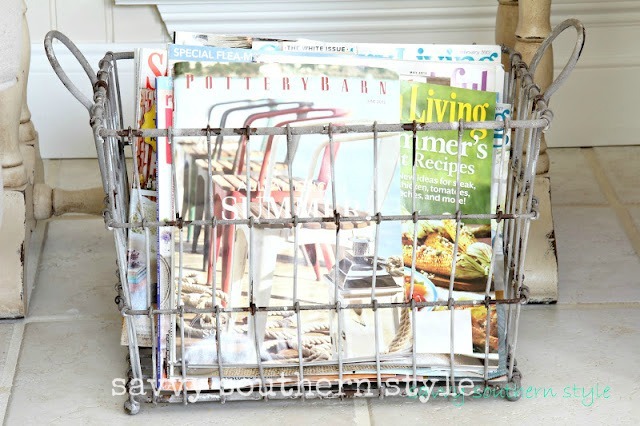 I've seen the olive buckets many times at the antique markets and always wondered what to do with them. I love their patina and texture and the fern's a perfect choice. Long live the fern! 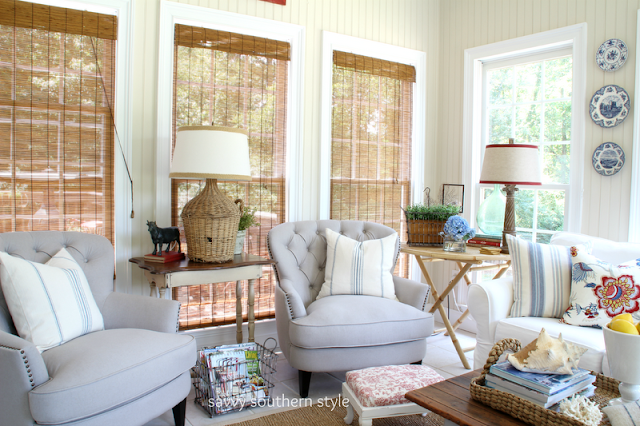 Kim, I've loved your sunroom in all of it's beautiful versions and this one is no exception! It feels so light an airy in there and I bet if feels 20 degrees cooler in there during those hot summer afternoons just because you've lightened it up so beautifully! GORgeous, Kim! I love the bench, new chairs and fabulous pops of color! It's so light, bright and welcoming! Love the sachets added to your coffee table vignette. I've been gone for a week, and I feel so out of the loop. Your room is just so fresh, lovely and sunny. I don't know how you leave it. Just beautiful, and I love the new bench. I featured it on the ranch's FB page, because it is too beautiful. It looks gorgeous, so bright and inviting. I love the pillows and the bits of color they add. I see we share the same reading material! 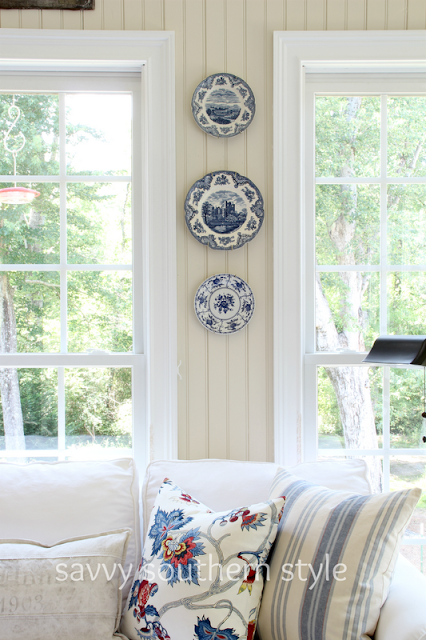 Love what you've done with the sunroom. It is light, airy, and so inviting. What color did you use? I really like it. So pretty I love the accessories. I like this colour combination best of all! It is light and airy and beautiful! Your porch is my dream! I didn't think it could get any better! It is just gorgeous Kim. This room is AMAZING!!!!! (Can I insert about 50 million exclamation points here)! Seriously. I think this is my favorite post ever. Every single time you change the sun room I love it more - and once again, this is now my favorite version! I love the pops of blue - just beautiful! I don't know how you do it. Every change is beautiful. Love this look. Thanks for sharing. My most favorite yet ~ although I think that with each transformation. But I'm loving this white, summery look. Would you come spend a week with me? I have lots of projects you could help with!! I want to sip coffee with you so I can sit in that fabulous sun room- and I don't even like coffee!! Every detail is perfect Kim! Straight out of Pottery Barn! Gorgeous. I am just now getting to this, Kim, and I am just flabbergasted with how fresh and beautiful it is. Beautiful, beautiful job! I just love your sun room Kim! Gorgeous! Oh my goodness, Kim! I LOVE how light and airy it looks! Every little detail is so refreshing. There are so many things I love about this..mostly I could cuddle right up and read.talk.laugh whatever. I love the primary pillows.the wire basket.the lamps..the bamboo shades...I could go on and on. This is a beautiful room! The light is fantastic and everything comes together so perfectly! It's very welcoming . . . just love it! It's so light and fresh and beautiful! Definitely my favorite room! Looks like it came straight out of a catalog, wow!!! Bright, fresh, and airy....love it:)! I love your sun room so much. It looks so serene & peaceful. Oh, Kim, I've enjoyed seeing your room in every decorating phase. It just makes me miss my sunroom in our previous home. We do have the perfect spot for one in this house, & may make that a reality some time down the road. I really like your mix of pillows & the cute bench. Stunning! It looks like it's come right out of the pages of Country Living Magazine. Visiting from the pin party and I love your room, so bright and cheerful...lots of wonderful attention to detail! Absolutely LOVE this room! Everything about it is so beautiful! I especially love the blue plates on the wall.